Nobody does it faster! We can authenticate any county notary signature within New York City and apostille documents for foreign country (Hague Convention Members) usage in under 2 hours. Our 26 years of developing key connections at each county clerk’s office in the New York Metropolitan Area, and especially at the New York State Department of State office, allows us the luxury of getting client apostilles completed in no time, and without scrutiny. We will layout requisite authentication and apostille fees on behalf of clients upon request. Clients quite frequently use our apostille services concerning documents that originate from all of the other 49 states and the District of Columbia. Our nationwide apostille service has the fastest turnaround. Non-Hague Convention nations require that the process of certifying documents (“Legalization”) for recognition in their respective countries be performed through the requisite country’s consulate or embassy in the United States (primarily in New York and Washington D.C.). Also, most Non-Hague Convention nations have an established mandate that documents be certified by the United States Department of State, prior to the aforementioned legalization process. We perform both of these requirements, expeditiously and effectively. Our 26 years of assisting clients with their legalization requests have allowed us to cultivate solid relationships with many consulate personnel throughout consulates all over the United States (most concentrated in New York and Washington, D.C.). We possess a perfect understanding of the dynamics and intricacies of each consulate’s complex legalization process. That adopted knowledge and invaluable experience over so many years uniquely qualify us to fulfill client legalization requests faster than most, and with a very high level of efficiency. Lines at the County Clerk’s office to acquire notary authentications are notoriously long. We patiently stand and wait on behalf of our clients, so they don’t have to experience that painstaking burden. Obtaining an apostille at a Secretary of State office or Department of State office (particularly in New York), can be a major hassle with the requirement of filling-out forms, waiting in extremely long lines, and sitting (sometimes standing) for extraordinary lengths of time in waiting areas for the completion of the requisite apostille. Clients never have to experience any of the aforementioned discomforts, as we happily go through those processes for them. Foreign consulates can be very particular and overly scrutinizing in their assessment of submitted documents for legalization. The process and procedures can be a real quagmire and a potential disaster for clients. Not for the professional staff personnel of Legal Retrieval Services, Inc. We work closely and together with consulate officials to make sure that document evaluations are properly made, and that client needs are understood and ultimately met. We are the perfect liaison between our clients and the foreign government consulates they seek to get document approval from. All fees rendered by County Clerk offices, Secretary and Department of State offices, consulates, and embassies for the processing of apostilles and legalizations can be disbursed by Legal Retrieval Services on behalf of our clients, so that the entire process goes faster, smoother, and remains void of bureaucratic delays. 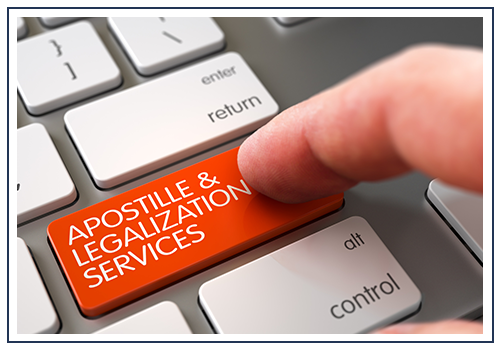 Clients contact us constantly for confirmation on whether or not a particular country is part of The Hague Convention to perform apostilles. Click HERE to conveniently view all the member nations of The Hague Convention.